It is always great to discover a great product that has proven valuable to consumers. 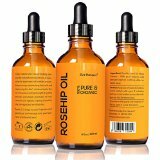 If you have an interest in the natural anti-aging process, then you will be interested in Rosehip seed oil. Rosehip Seed Oil is derived from rosehip fruit seeds. It is a wild plant, growing in Chile. The oil is dry, which means that it can be absorbed easily and quickly into the skin, not leaving any oily residue. This seed oil was discovered in the 1980s and is a rose plant that Chileans are especially proud of. They have used it for centuries. A study was conducted of more than 180 people using the seed oil on their chronic skin problems. Some of these conditions included premature aging, scarring, UV ray damage and wrinkling. In the study, the oil was applied from the seed of the rose plant and it produced noticeable results. In fact, it reduced the appearances of scars and wrinkles. It also rejuvenated the skin and improved the skin color and skin tone. Other studies done after this did find the same or even better results. Further research has been done and it has been found that the tissue regeneration is the most noticeable benefit of rosehip seed oil. This is so in relation to treating scars after surgery and for facial wrinkles. Because of its therapeutic impact, this product has become quite popular even though, the product is seemingly expensive and can only last for a short period of time prior to becoming sour. Therefore, it is best to purchase it in small quantities or store in a cool place. With these attributes, Rosehip seed oil can be deemed a powerful agent for the regeneration of the skin. The essential fatty acids found in the product translate to prostaglandins. These help in the regeneration of tissue and cellular membrane of the skin. With this regeneration, scars, stretch marks and sun damage are eliminated. It also helps in the prevention of the keloid scar tissue formation. This is the thickening of the skin in the form of a scar. Its therapeutic value is considered to be of a high level, containing oleic fatty acids, linoleic and linolenic. Also contained in it is a derivative of Vitamin A (Retinol) called Tretinoin. This helps to replenish and rebuild the tissues of the skin. It also carries oil for proper skin care, reducing wrinkles and all visible signs of premature aging, especially crow’s feet and fine wrinkles. It diminishes the redness resulting from scar tissues such as keloid scar build-up, even old scars. The dermatological and cosmetic communities have both authenticated the benefits of rose hip seed oil. Its most common use is to hydrate the skin and helpful in the treatment of psoriasis, acne and eczema. It comes in lotions and creams as well as oils. You can combine essential oils such as jojoba with the Rosehip seed oil for better impact on the skin. After you open the product, you should refrigerate for increased shelf life. Have you used Rosehip seed oil before? Let us know of your experience by leaving your comments below.